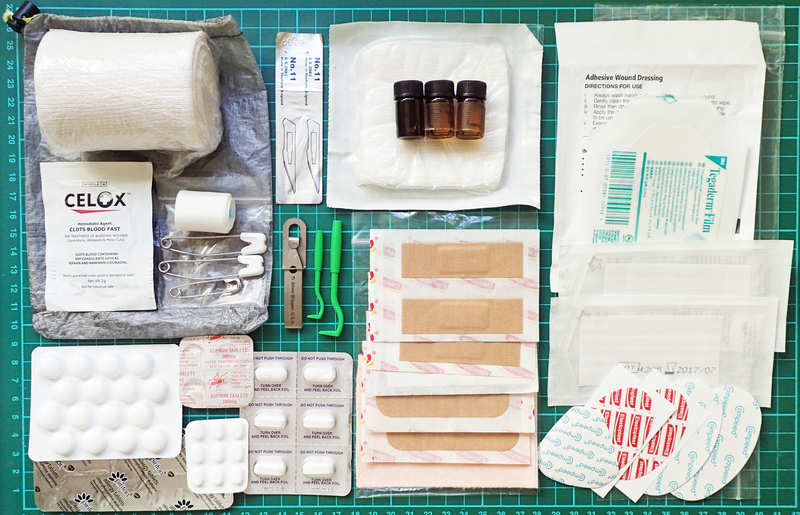 While the First Aid Kit in the image above is perhaps just a tad excessive, some form of more modest First Aid kit should be carried by every hiker. This should be tailored to their own needs with personal medication being included as necessary. 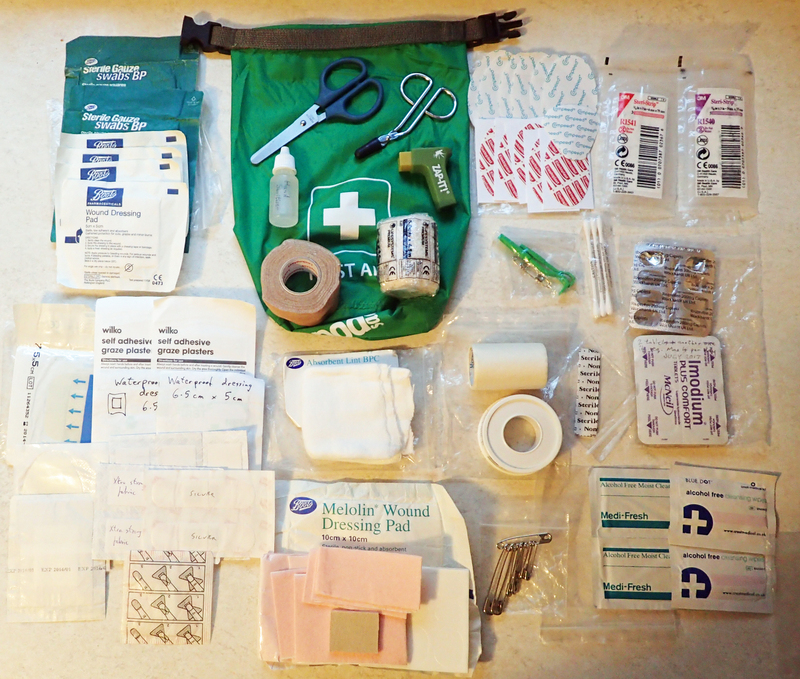 Leaders of a larger group should ensure that they are also armed with the necessary skills if shouldering the First Aid responsibility and may consider taking a ‘group kit’ that is better equipped. The First Aid Kit carried by Three Points of the Compass has varied over the years but has now, more or less, settled down to a core of items, with one or two additions finding their way in according to circumstance- length of hike, season etc. A kit may be as little as a modicum of duct tape and some hand gel for a brief day hike, or as much as shown below in my ‘family’ kit. First Aid Kits are a very personal item and the relative benefits (or not) of proposed contents creates considerable ire in people who should know better. I have my own preferences and opinions and it is these that I discuss here. You may be able to take some knowledge and ideas from it. Beyond the contents themselves, if practical, try and ensure that the components of a First Aid Kit are contained within a waterproof and dust-proof outer covering, or at least protected from contamination as far as is practical. It is helpful if this is either see-through or easily identifiable to enable it to be found easily, possibly by someone other than yourself. To that end, it should also be easy to find, extract from the pack and undo. It is inadvisable to bury it in the depths or you will regret this at some point when you have to pull out all the contents of your pack on to wet or muddy ground when you least want to. An outer pocket of the pack may be a preferable option where practical. Always carry it in the same place so that you know exactly where to pull it from when needed, potentially one handed, in poor weather, at night. Some people like to carry a small square of polycro or Tyvek in the top of the kit on which to spread the contents, there is less chance of items slipping into the undergrowth, never to be seen again. Alternatively, spreading a bandanna or handkerchief on the ground works equally as well. While it is possible to take nothing, this minimalist kit is probably the least that any hiker would want sitting in the pack. It contains a bit of pain relief, something for the odd blister or two and a covering for the inevitable scratch or three. 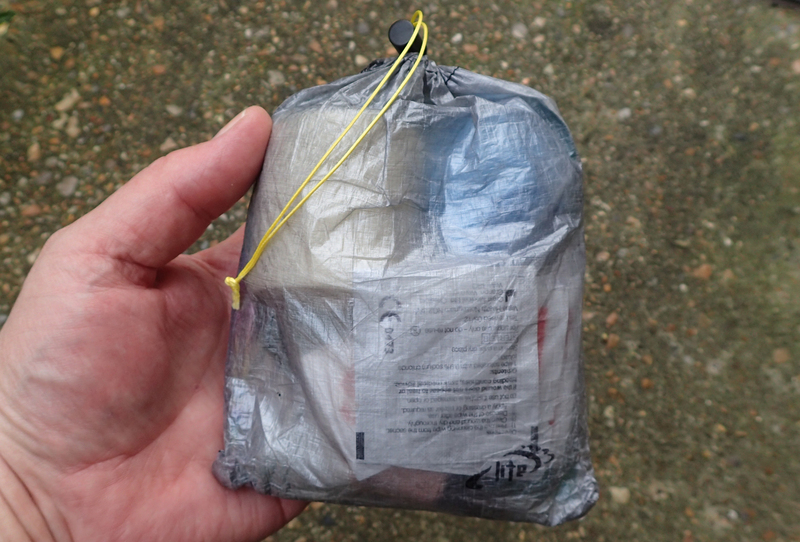 A small ziplock bag is all that is required to keep the contents dry and free of dust or contaminants. At a total of 12g, few would complain as to its excesses. 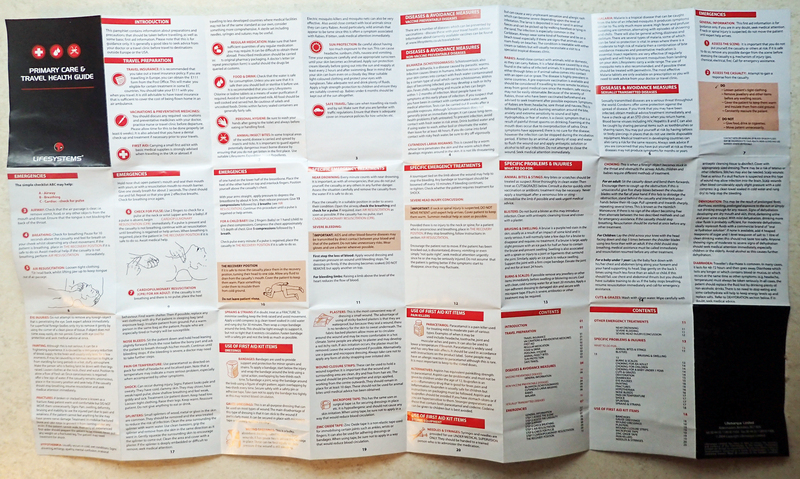 It is wise to make a note as to what medicines are if they are not sealed within a printed blister pack. Also keep in mind expiry date of unsealed medicines. Dosage rates are an essential piece of information too. 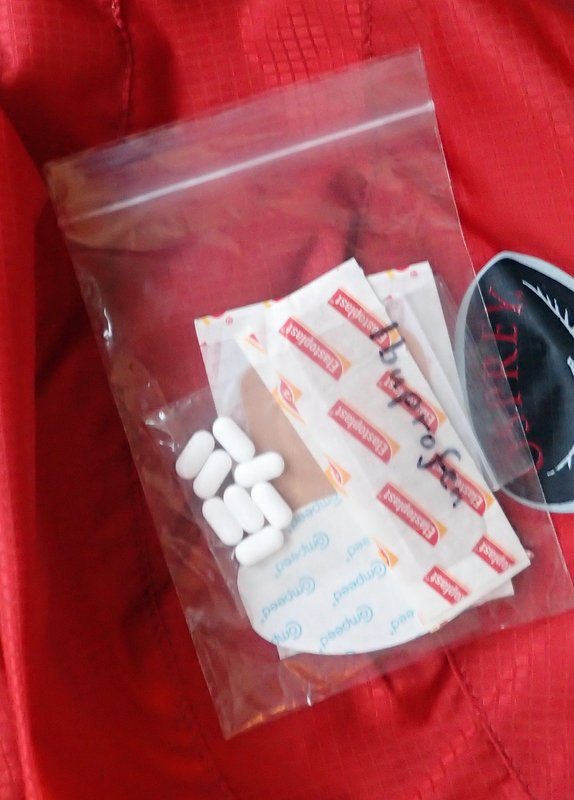 When my wife accompanies me on treks she carries her own First Aid kit. When I built and subsequently refined this, I ensured the contents were focused on what has proved to be of most use to her specific needs over the years. With my wife it is normally feet issues that manifest themselves so the great majority of that listed below will enable many problems with the feet to be dealt with. The antiseptic liquid can be applied to nails or blisters and causes least skin irritation. These contents will prove sufficient for up to a week normally. If necessary, it can be supplemented by my own, more comprehensive kit. For longer hikes, two or three precut strips (total- 3g) of 25mm Leukotape might be carried in this kit too, they are affixed to silicone release paper so are ready for immediate use. Personal medications are also added or carried elsewhere. My wife does not carry a separate knife in her pack so the contents of her First Aid Kit have to deal with blisters, splinters, trimming skin and cutting plasters etc. 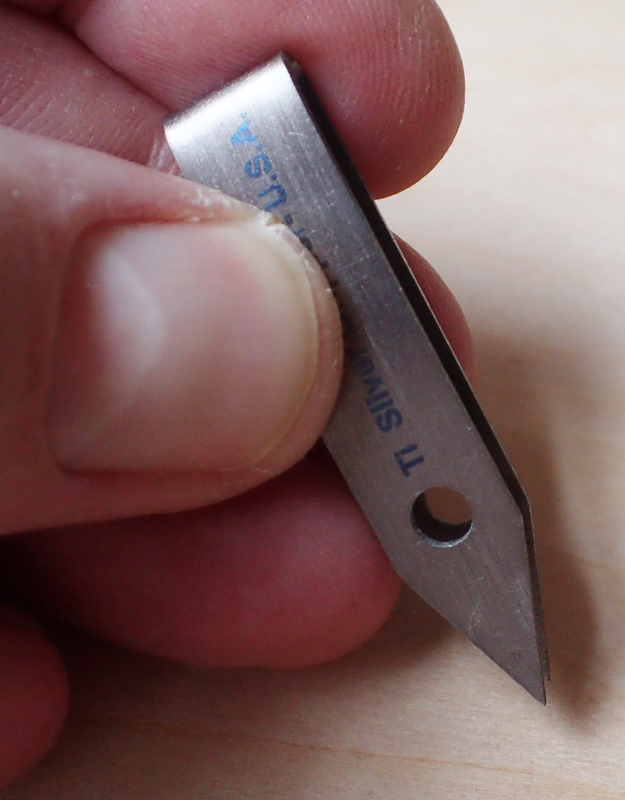 The Leatherman Style is a great little knife that I have written about elsewhere. 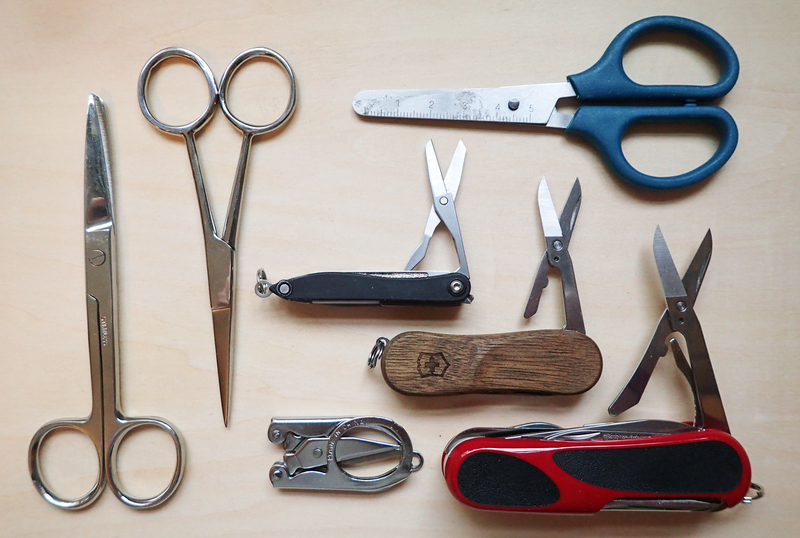 It features most of the tools of most use including a small pair of scissors. 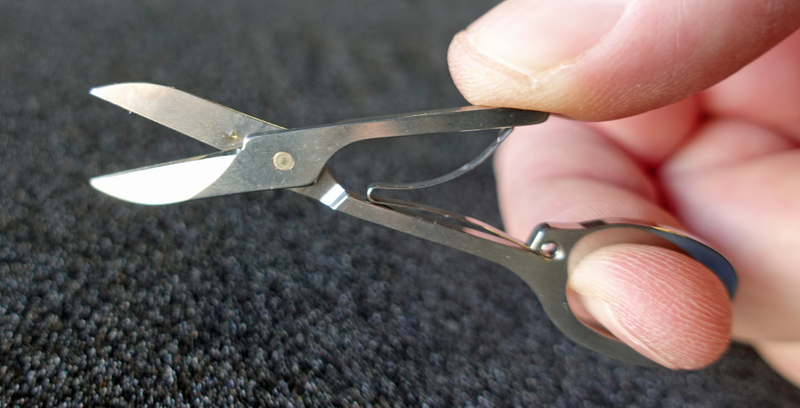 Unlike those provided on other knives, such as the Wenger, these scissors are not serrated and the small size can mean that it is more difficult to gain purchase on a slippery nail if used for trimming. 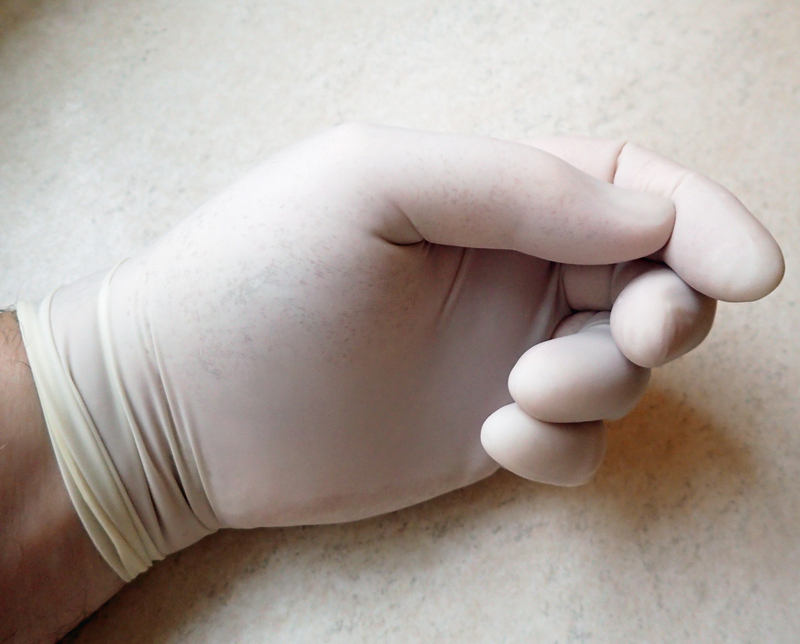 If you feel that you may be administering first aid in a risk situation or in the vicinity of body fluids, it may be wise to carry one or more pairs of examination gloves in your First Aid Kit in order to offer protection against contamination, dirt or potential irritants. 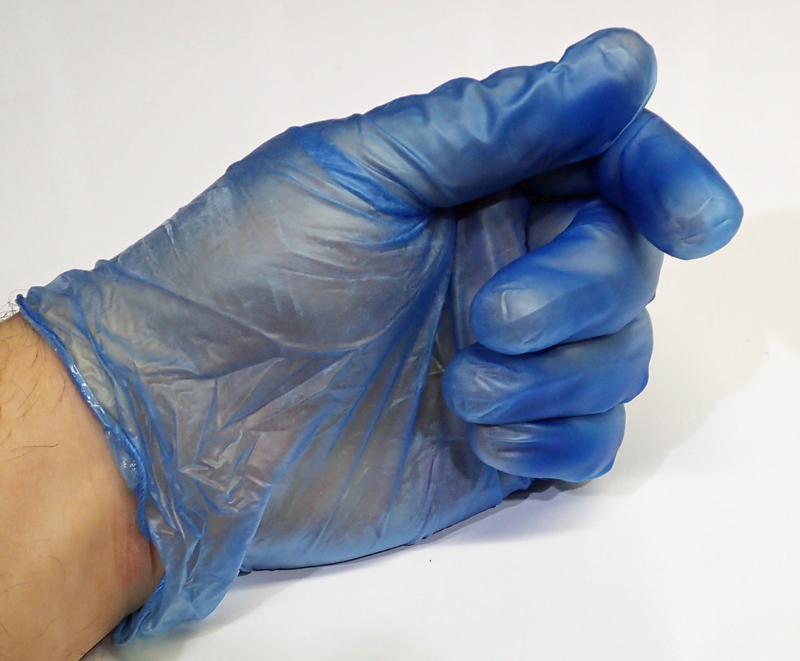 There are three main choices of glove- Vinyl, Latex or Nitrile. 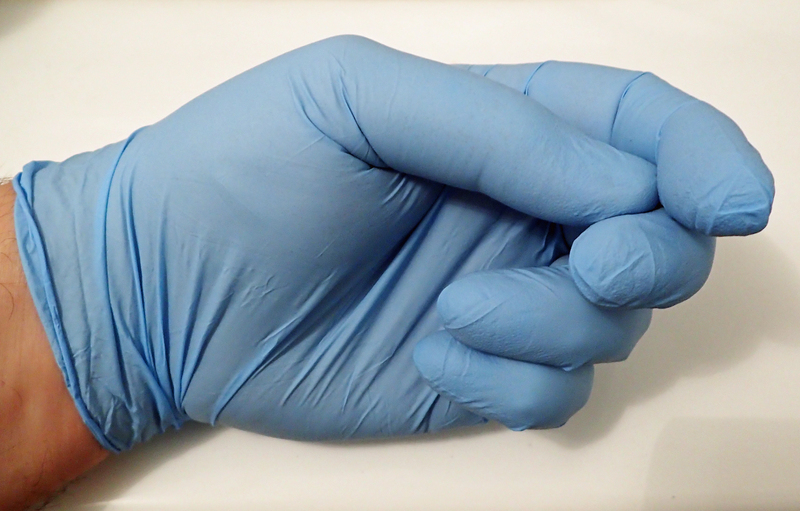 A pair of examination gloves will fit into a small baggie with ease and keep free from dirt and contamination until required. It is perhaps important to remember just why you are carrying such a kit and what it is for. It primarily for just that- for first aid. Potentially to stabilise an individual before seeking, possibly professional, medical aid elsewhere. Obviously what normally occurs is that a first aid kit proves to be enough to deal with a problem and follow up action is not required- great. What a First Aid Kit is not providing is the means to carry out complicated medical procedure. This quite large kit would be carried by myself if our family were on the trail together, or I were in a more small group and was not confident that other party members were properly equipped. This kit includes both primary and secondary items, that is, items that can supplement a personal kit, yet still act alone. There is very little in the way of chemical medicine contained within this large First Aid Kit. Imodium and Ibuprofen have invariably proved sufficient. Stronger, or more specific, prescription medication has been carried in the past but normally by the individual who requires it, not within this ‘group’ or family kit. On that subject, a note from the doctor or a prescription may be advisable as this can avoid awkward questioning if medication is found by the authorities. This fairly large kit will deal with the great majority of problems that may befall a small group. Roughly 80% of the items contained have been used and replaced at some point over the years. This may sound a lot but more reflects that it has been honed to a size that is both practical and comprehensive. There is considerable redundancy but I feel that the extra bulk and weight that results is justified with the peace of mind and capability generated when responsible for others. Some things are not included that others might feel necessary. There is no irrigation syringe for example, nor CPR mask. Note that I occasionally write the detail from the removed packaging on the item- size, recommended date of expiry etc. It can be seen how very easy it is for the weight of a First Aid Kit to creep up. This is by no means a lightweight kit, but it could very easily weigh more. I have toyed with the idea of including a Sam splint or similar in this kit but have not as yet as I believe that I have the ability to fashion a functional splint from either what is carried or encountered trail side. A Sam Splint, for those unfamiliar with them, is a compact, lightweight, aluminium alloy core sandwiched between two layers of closed cell foam. It can be trimmed or bent into various curves to support a broken or badly sprained limb. The Podsac that it is all held in is quite a heavy item, but will take immersion and knocks well. It is particularity well suited to travelling by canoe or bike where water, rattles and knocks are prevalent. 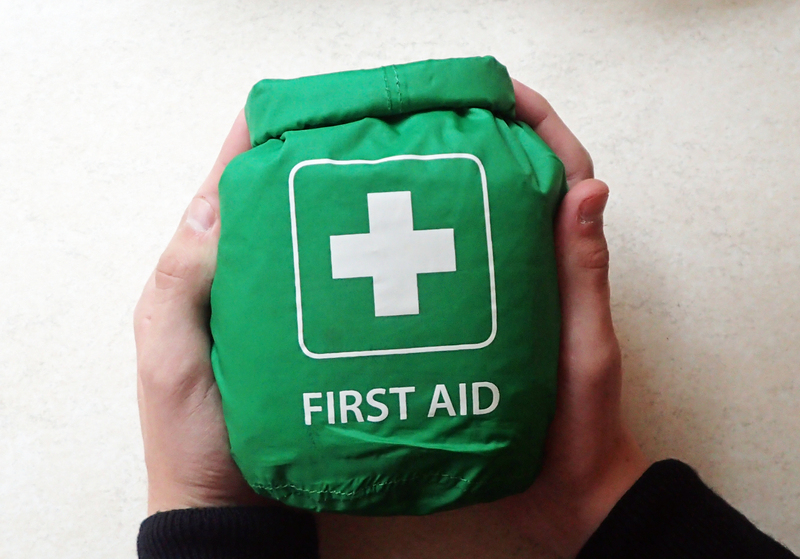 The Podsac First Aid roll top bags are available in two sizes- small 1.5lt and large 4lt. They are made of 70D nylon with a white TPU coating interior so as to make finding items inside easier. First available in 2011, these useful bags seem to be getting more difficult to locate now and it may be only old stock that is available. Other important parts of a first aid armoury, probably carried elsewhere on your person or pack, are pen and paper (or similar). In the awful scenario of major trauma- shock, loss of consciousness, severe loss of blood etc, a written record of symptoms and treatment is of immense help to follow up medical care. It is advisable to carry some items that can be used to treat specific injuries. For example, an antispetic for cleansing minor cuts and grazes and to guard against infection. I will chat more on antiseptics below. Bandages will protect and support minor injuries and strains while dressings of various types can be used to protect wounds. Smaller plasters can be used on smaller wounds and cuts. 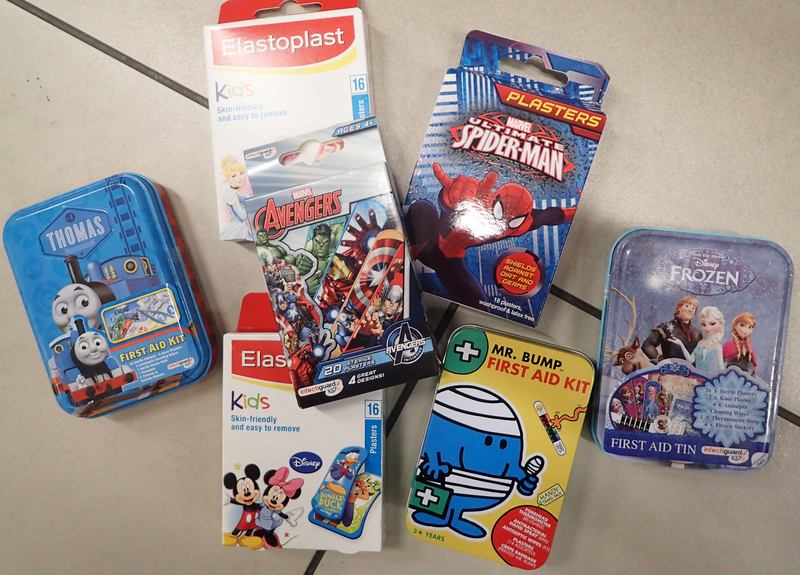 A quick scan of the relevant shelf in any supermarket or pharmacy reveals a bewildering array of plasters- Different shapes, sizes, fabrics and so on. I don’t carry spray on plasters, I don’t like them, finding them largely impractical for an outdoor hiking environment. You may disagree. Fabric dressing strips can be useful as these enable exactly the correct width to be used. However unless they are being applied by a third party, they can be impossible to manipulate and wielding a small pair of scissors, attempting to cut through a multi layered plaster while dripping blood everywhere will quickly dissuade you from including them again. A small selection of sizes is a preferable option for solo use. Cheaper fabric plasters are invariably not up to the job, they require dry skin and easily peel off with sweat and rain. Something sturdier is required. There are various types of heavyweight plasters. The inclusion of one or two waterproof plasters may be advisable too. Beware the cheaper waterproof plasters as they fall off with ease, better quality examples are available, look for those that include an antibacterial barrier in their construction. It is may be preferable to include hypo-allergenic products where possible. I carry either ‘cut-to-length’, or two or three sizes of Coverplast Classic plasters in my First Aid Kit for multi-day hikes. These do have a natural rubber based latex adhesive, so may not suit everyone. I don’t see much point including small plasters, so now usually just have fairly large 22mm x 72m and 50mm x 72mm fabric plaster dressings that will cover most smaller scrapes and cuts and take quite a bit of wear and tear on the trail. Specialised blister plasters should be used with care. They are designed to stay in place until they virtually fall off. In that time it is possible for maceration to occur to the skin and the whole come adrift, taking a large portion of skin with it. This is due to the lack of porosity in the plaster. However, once the damage has been done and the decision taken to use one, they can do a great job of preventing the introduction of bacteria while providing some release from constant friction and pressure pain. 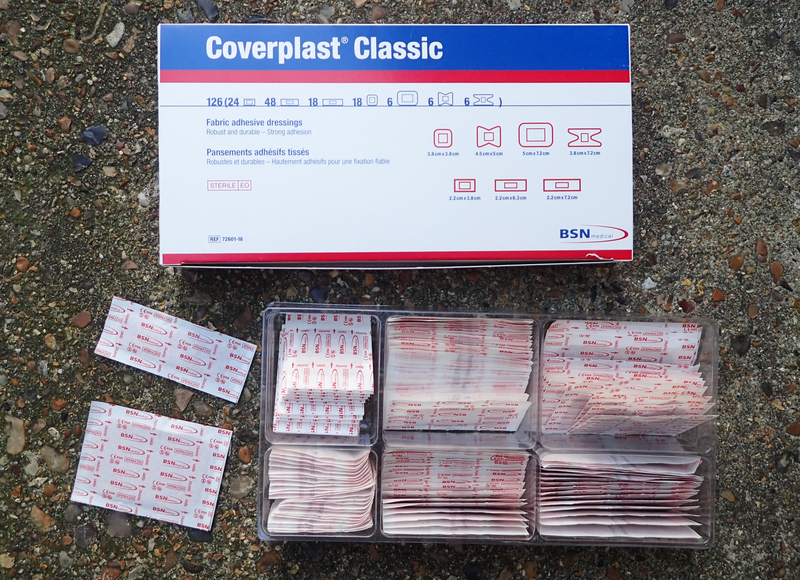 The thinner blister plasters produced by Elastoplast shown here can be a useful alternative to Compeeds but lack their cushioning. 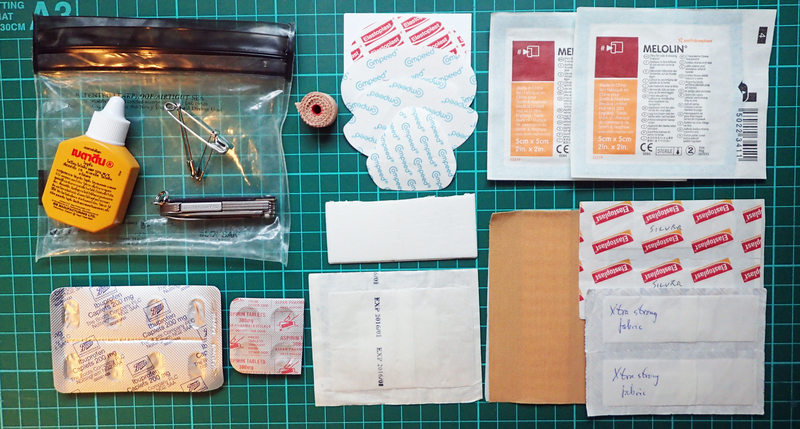 Alongside a handful of plasters, a few skin closure strips or steri-strips (sometimes called butterfly stitches) are a good and very lightweight addition to a first aid kit. Just ensure that you have cleaned a wound as much as you can, picking out any foreign matter, preferably possibly irrigated it too with clean water before using these. It is a good idea to practice applying steri-strips with your non-dominant hand at home as they can be a bit fiddly. One last point on plasters and dressings, while I don’t carry it, a small dropper bottle of Friars Balsam, or Compound Benzoin Tincture (not Tincture of Benzoin which is used as an inhalant), may be useful to some. This sticky resin is great at aiding adherence when applied to the skin in hot or sweaty conditions. A small selection of dressings form a valuable addition to a kit, complimenting the plasters and tape carried, be it microporous or other. I carry a very small range of good quality dressings for covering larger cuts and grazes. I also infrequently include a modicum of absorbent lint for additional soft cushioning and absorbency. I frequently take a gauze dressing or two with me. Combined with other items they can be used on many types of wound. While they can adhere to a bloody, or plasma leaking wound, they are easy to fasten into place with micropore tape or one of the more modern alternatives, or even duct tape. Melolin dressings have a perforated, breathable, film layer to prevent the dressing from adhering to the wound. They are relatively low absorbency and are suited for use on dry wounds, or superficial cuts, abrasions and lightly exuding wounds. If there is heavy blood flow or similar a secondary absorbent pad should be placed over the top of the melolin dressing. For this, a bandanna or similar could suffice. Melolin can be purchased as either sterile or non-sterile. A crepe bandage is bought into use for the more severe strains and sprains. It is very easy to cause further injury by continued exercise on a sprain but if walking in the wilds, self recovery may be the only way out. Both forms of injury require the same treatment as soon as possible, that is- R.I.C.E.- Rest, Ice, Compression, Elevation. Note that ‘Ice’ does not have to actually be ice (which should, in any case, never be applied direct to the skin) but a cold compress will suit. Silicone gel toe protectors are simple to roll and put on, are washable, reusable and can be cut to shape if required. The inclusion of a couple of these in a first aid kit could mean immediate relief from rubbing, friction or pressure points. 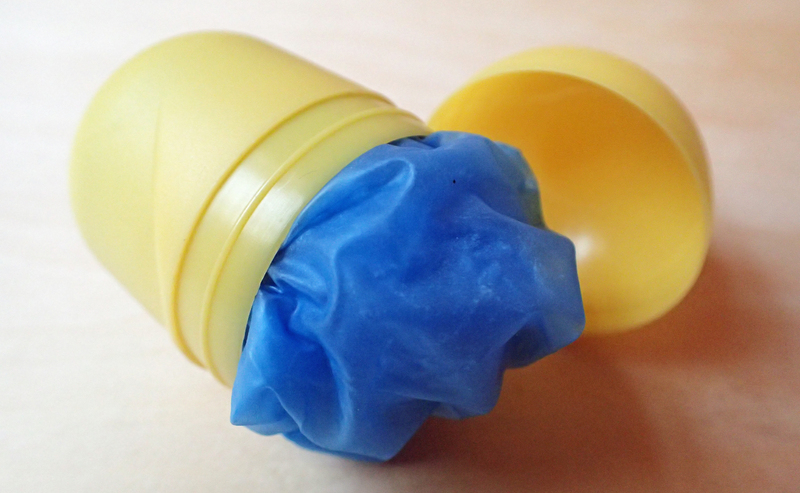 The medical grade silicone gel is hypoallergenic, soft and comfortable. These examples are from Sumifun and a range of sizes can be purchased. A pair of fine point tweezers is the type to carry for tick removal, this enables you to get below the head and avoid squeezing the body fluids into yourself. 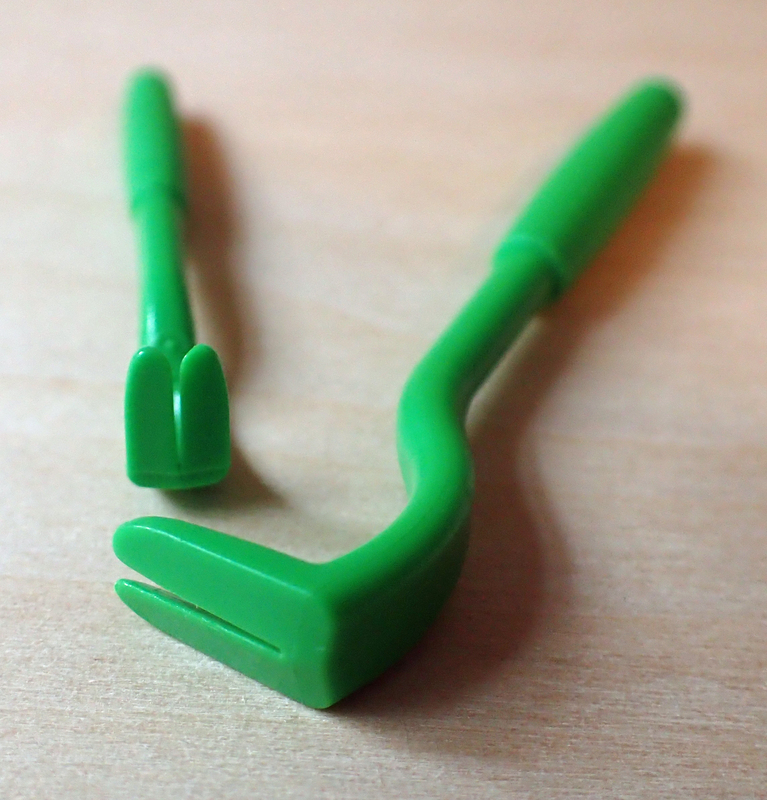 In addition to a pair of tweezers, I do like to carry a dedicated tool for tick removal. With such a dangerous little creature it is not worth messing about and the few grams are easily justified. I like the O’Tom Tick Twister and carry both sizes in tick season. Both together weigh a paltry 2.2g. I shall not attempt to describe the necessary actions to discourage ticks in the first place. Some web sites offer very good advice on hiking in tick country. Here is another, fifteen minute long, piece of film that gives a good overview. One last point regarding Ticks, and mosquitoes for that matter, do consider applying permethrin to clothing in advance of a hike, the little buggers don’t like the stuff at all. There is some confusion on the difference between antibiotics, antibacterials and antiseptics. Not surprising once you also throw disinfectant, antimicrobial etc. in to the mix. Rather than my giving equally confusing advice here, it is best to be aware that there ARE differences. Identify what exactly you wish the contents of a First Aid Kit to do and then research accordingly for that which you wish to include. But, put simply, an antiseptic inhibits or kills micro-organisms (sterilises) while antibiotics specifically target only bacteria. There are some that feel that antiseptic creams deserve no place in a First Aid Kit. The purpose of an antiseptic cream is to fight infection. While antibiotics target specifically (bacteria), antiseptics are more broad in their action- acting on bacteria, fungi, viruses and other. Some people, with far more knowledge than I, believe that antiseptic creams can actually inhibit healing, particularly on open wounds. I suggest you do your research and form your own opinion. I shall continue to use antiseptic creams on occasion, but recognise that overall hygiene and guarding from secondary infection is equally as important. Use of soap and water where possible are part of an effective arsenal. In addition to soap and water, there are favoured creams- Germolene and Sudocream amongst them, that many hikers swear by. While others may have a preference for the Tea Tree creams or a small bottle of Tea Tree essential oil instead. I recognise that the medical profession is shying away from the use of antiseptics for wound cleansing, often advocating irrigation with sodium chloride. I am now a little unsure of what is actual best practice so now often throw in a couple of small wound cleaning wipes that simply contain 0.9% sodium chloride solution, in other words- salt! In addition to antiseptic wipes and more recently, a small bottle of Povidone-Iodine liquid antiseptic, one of two particular antiseptic creams have often found their way in to my First Aid Kits though I find I am now moving away from them. The first is a long standing resident in the family ‘home-kit’, while the second is particularly well known in the North American hiking community. 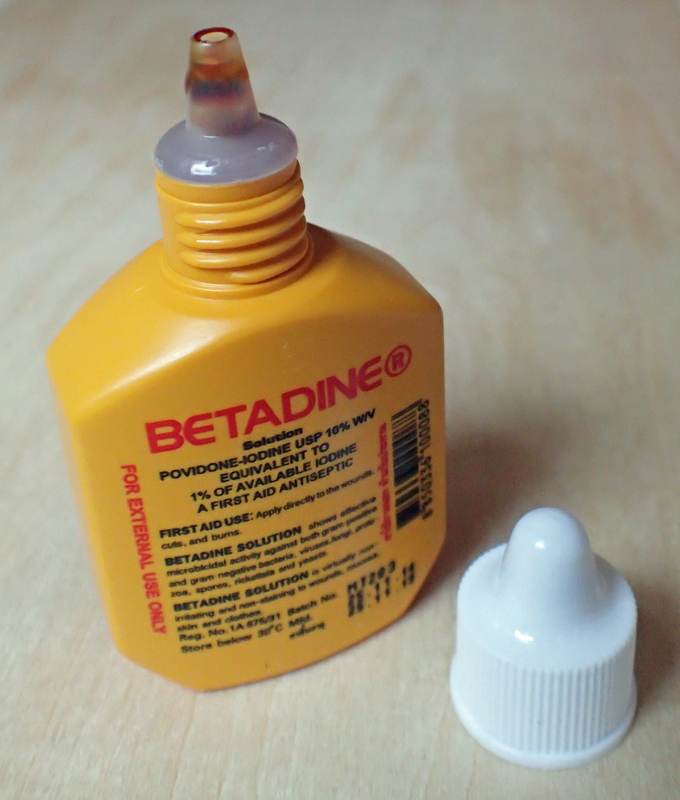 Active ingredients- Cetrimide and Chlorhexidine Gluconate. 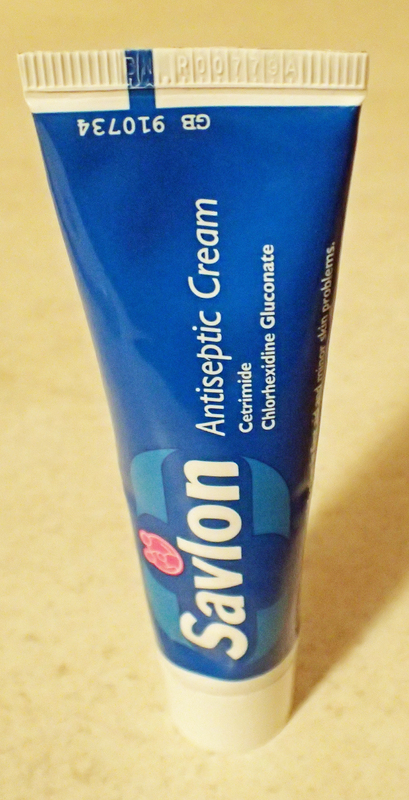 Known in the Three Points of the Compass family as ‘Grand-dad’s Magic Cream’, Savlon was applied by my father-in-law with impunity on any graze, knock or scrape. In addition to any healing properties in the cream itself, no doubt the placebo effect on my daughter was equally as powerful. You should not under-estimate just how effective a placebo can be, particularly with children. Active ingredients- Bacitracin, Neomycin and Polymyxin B. 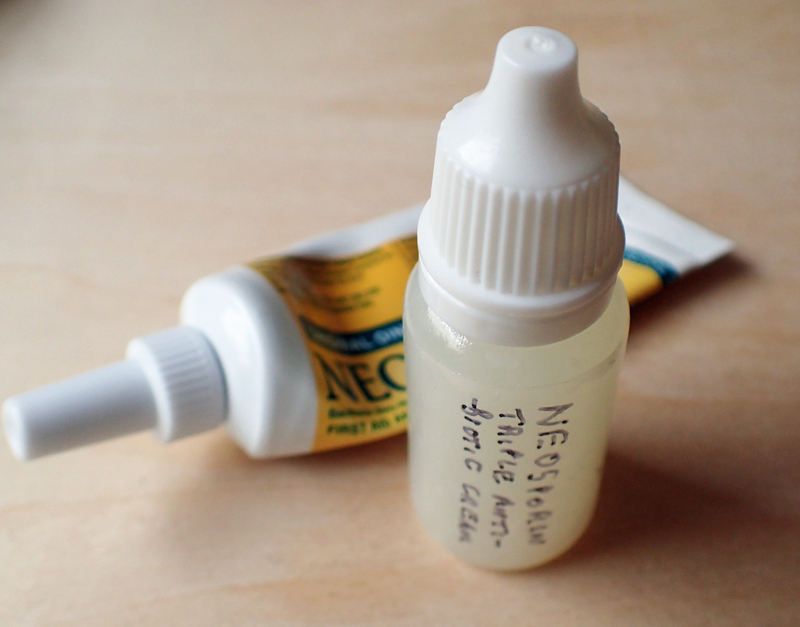 A 14.2g tube of Neosporin Triple Biotic cream actually weighs 17.1g. Note that 9.7g of the cream will fit in a tiny dropper bottle (empty- 3.7g). My only reason for doing this is to save a little on the bulk as the weight when full is still 13.4g. To be honest, it probably squeezes more easily out of the tube than the bottle too. I will mention that there have been some concerns voiced regarding the ingredients-Neomycin in particular. In addition to an antiseptic cream, something to prevent its need, in advance, may be useful. A small dropper bottle of bite and sting cream is a very useful addition, most obviously during the summer months- possibly the most important aspect of these creams is to reduce scratching. Thereby reducing the chance of the skin being broken and infection being introduced. A small card detailing your Doctors name, surgery address and phone number would be a useful inclusion in your pack, and potentially within your First Aid Kit. You may need to take personal medicines. In which case a copy of your prescription should also be carried. If stopped by the authorities it may be convenient to be able to produce the paperwork to explain the potentially quite powerful drugs you are carrying. Not only that, but a repeat prescription could prove essential should those medicines carried be lost for some reason. If carrying a group kit, it is advisable to know beforehand of any allergies or personal medical issues within the group. Any group leader should be aware if those in his group have any medical conditions or medicines he/she should be aware of. Particular anti-histamine, or an EpiPen auto-injector, might be necessary or advisable for some individuals. You might want to consider including examination gloves and a CPR mask. There are other items that can be taken that may form part of the contents of a First Aid Kit, however these are normally dotted around my pack pockets, frequently hip pockets etc. Many of these will be dependent on what season it is. These might include sun screen, lip balm, foot creams, eczema cream, insect repellant, bite and sting relief, duct tape and anti bacterial hand gel- that last of great importance in reducing hand to mouth or wound contamination, though far more effective if soap and water is used first. 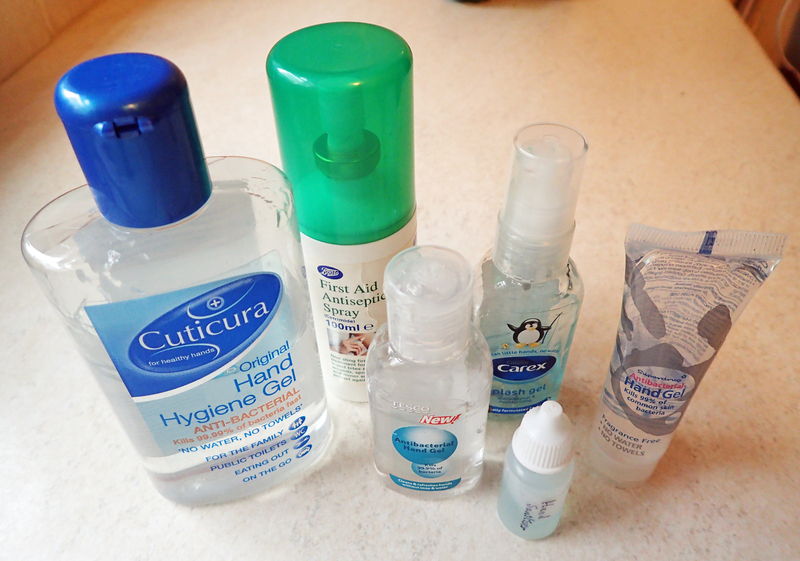 Instead of taking full or travel size bottles of creams etc. consider decanting into smaller nalgene or generic bottles. Simpy take the amount you need and save on both weight and bulk. eBay and Amazon will turn up sachets of some products, such as 1% hydrocortizone, that can either be used as single use as required, or part used and the top folded over. 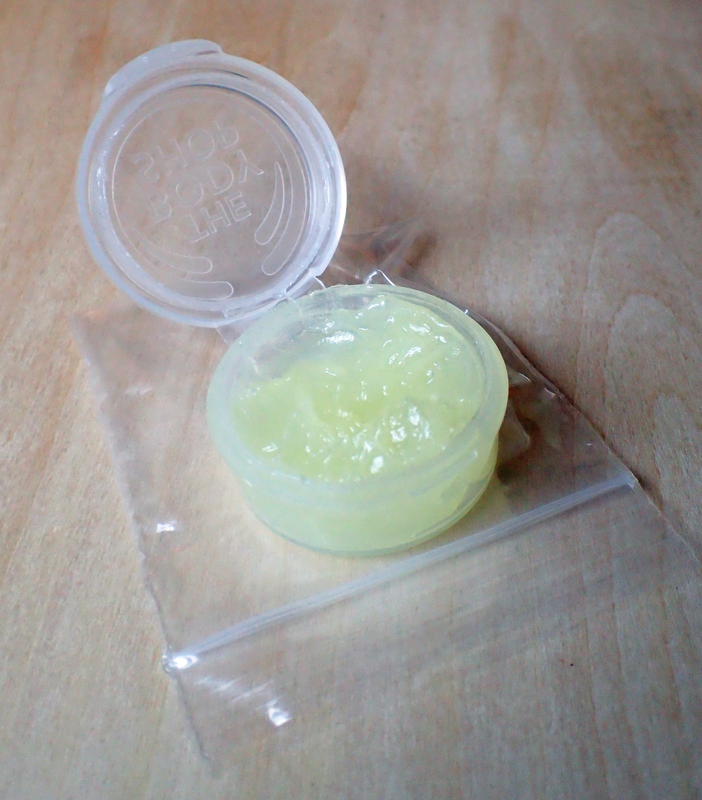 With care and storing in a small baggie, leakage should not occur. Gold Bond and other powders come in multiple sizes of bottle, again, take the smallest you can find or decant into smaller. On that note, take the talc based Gold Bond and not the corn starch variety which can feed bacteria. When considering additions, it is very, very easy to get carried away and take far too much. I am as guilty as the next. It simply isn’t possible to prepare for everything. Emergency dental fill has not made it onto my Amazon wish list however I have had a 25g QuikClot 1st Response blood clotting sponge on there for, well, a long time. It hasn’t yet crossed over into my First Aid Kit. However you will see that I have occasionally thought to include one or two of the small 2g Celox packets, this is another clotting medium, in granular form- all clever stuff. Launched in 2006, Celox is a natural polymer containing chitosan and is derived from shrimp shells and then purified. When Celox comes into contact with blood, it swells, gels in around thirty seconds and sticks together, without creating heat, to form a ‘clot’. When necessary, this can be washed from the wound, though it is broken down in the body to leave glucosamine, a sugar. I have seen quite horrendous images of ripped apart hands where hikers have done battle with barbed wire. The potential is there in the wilds to cause severe harm and a small 2g pouch could prove very useful on occasion, I just hope I don’t have that occasion. The use of styptic powder for localised contracting of blood vessels has begun to move away from the veterinary trade and individuals that are particularly at risk from bleeds have been advised to carry it on occasion. However I have no experience of it and cannot personally recommend its use. Anti-bacterial hand gels and sprays come in a myriad of sizes from a number of manufacturers. Those containing alcohol can aid in fire lighting however you may like to search out alcohol free alternatives due to the concerns raised by many as to the possible detrimental effect that alcohol may have on open wound healing. Whatever size or type you decide on, decanting into a smaller bottle can save on weight and bulk. Elastic bandages are a useful addition to a hikers First Aid Kit for use in the event of strains and injury where extra support or compression is required. These reusable bandage, available in a variety of widths, reduce swelling and relieve pain to an extent. There are many makes of elasticated bandages. A keyword search on both Amazon and ebay will turn up many. As to which width to choose- while 2″ / 50 mm is most suited for use on wrist, hand and foot injuries, the wider 3″ / 76mm is probably the most useful for inclusion in a hikers kit. This width is most useful on elbows, ankle and knee injuries but can also be used on the lower foot with care. Don’t shy away from sufficient length either. In my lightweight, multi-day kit, I include a 3″ / 76mm wide by 64″ / 1.6m long compression bandage with velcro hook closure. I think the 4″ width bandages are too wide being primarily for shoulder or lower leg injury. The ACE bandage can be washed and reused many times and is extremely suited for the more punishing demand placed upon it on a long trek. While also capable of being washed, if only once or twice, a 50mm x 4m (when stretched) cotton/elastane with latex, self-supporting, cohesive support bandage is more suited to day or two day long hikes. Note that these bandages have a small amount of latex in them which may cause a reaction to those with an intolerance. If you have ever suffered from it, you will be as familiar as I am with simply how miserable you can get if suffering from severe ‘runs’, or the trots, as in, you need to keep trotting to the bathroom. Once experienced, the lesson is learnt and even though it is some years since any such suffering, I now include some form of medicine for treating sudden short-lived and acute attacks of diarrhoea. 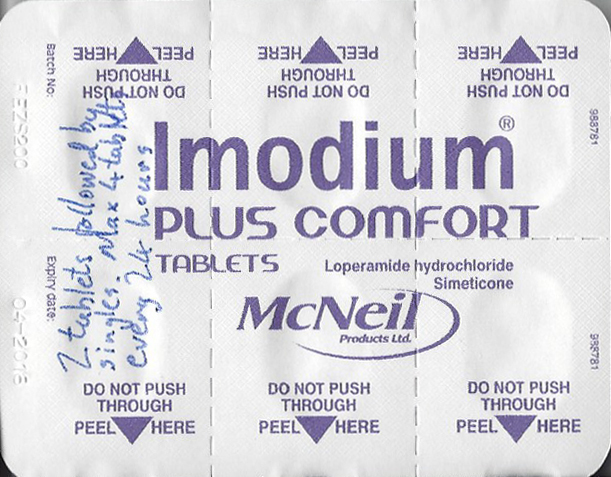 Each tablet of Imodium Plus Comfort contains 2mg Loperamide hydrochloride and Simeticone equivalent to 125mg dimeticone, which can also be taken to calm additional abdominal discomfort such as cramps, wind and bloating. There are various different brands of effective anti-diarrhoeal. The symptoms are not something I really want to dwell on now but a little forethought and inclusion of the necessary is time well spent. If you think it is something from which you will never be troubled, think on this- it has been estimated that between 35% and 50% of travellers will suffer from diarrhoea when visiting countries in which standards of hygiene and sanitation are lower than that normally experienced, and there are the very factors experienced on the trail. Most instances of ‘trail-runs’ can be attributed to poor hygiene or poor water. Look after those factors and there should be little need for the medicines to deal with the aftermath. An additional word though, an important aspect of dealing with any lengthy case of diarrhoea is the additional need for rehydration and replacement of lost body salts. While I have carried oral hydration packets in the past, the excellent blackcurrant flavoured Dioralyte amongst them, I have not done so for some years. I now feel that flat coke, or a mix of salt and sugar in water, or not being far from a town, particularly in most of Europe, is enough in itself. I shall not dwell on the dual issues of Giardia and Crytosporidium, suffice here to say that the risks are real and growing and it is avoidance and prevention that can guard best against the two, rather than looking to treatment following. Every hiker should be reading and taking note of what Kathleen Meyer has attempted, over two decades, to bring to our attention. 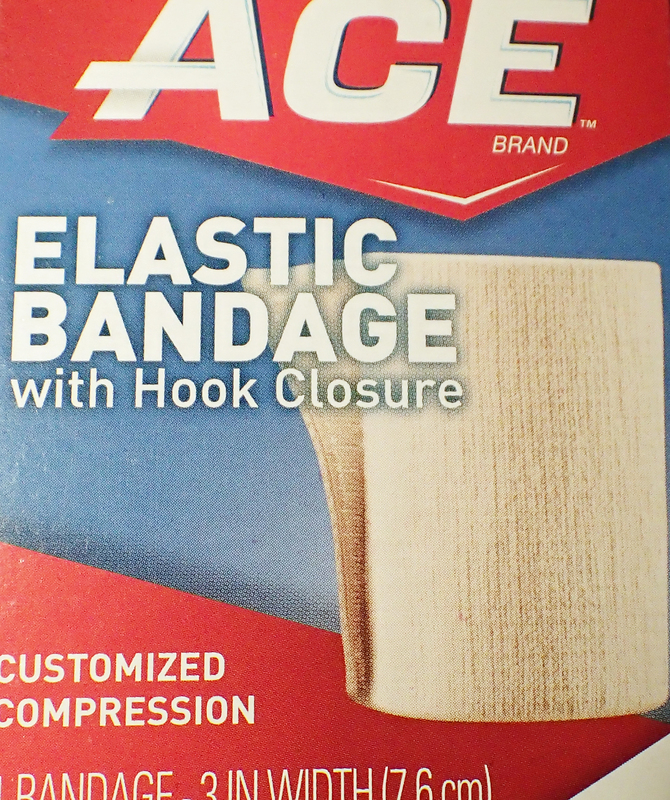 While a larger, more durable ACE bandage can be justified for longer hikes, I only include a smaller cohesive bandage in the day kit for use in the event of a strain, sprain or for holding dressings in place. The one included is suitable for use with wrists, ankles, elbows, arms, or, at a push, knees. I only need to get off the trail and not keep myself going for the days to come, so one of these soft, self securing bandages will suffice. These bandages are particularly good on hairy parts of the body as they do not stick to hair or skin, so are ideally suited to those of us with hairy legs who want to avoid an instant waxing! The stretchy cohesive bandage is very easy to apply as it adheres securely to itself so no need for pins or tape. It can even be unwound carefully, washed and reused once or twice if required. The inclusion of a length of some type of tape is advisable for a number of reasons. 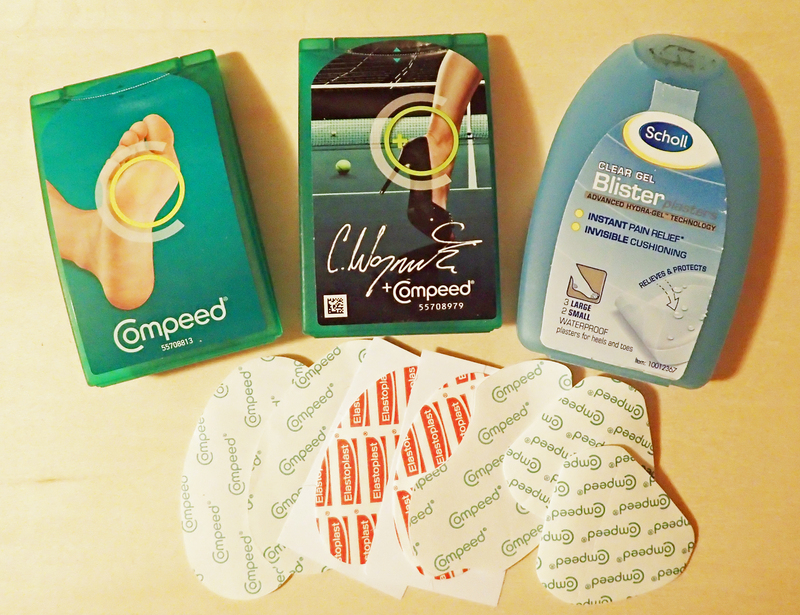 As a covering for blisters, hot spots, cuts and grazes. To hold dressings or gauze in place, strap muscles and sprains, immobilise joints, hold splints or to patch up tents, torn waterproofs or fix holes in packs and broken straps. Duct tape is an old favourite for good reason. Like many others, I keep a length wound onto my hiking poles. Note that in this position, it can in no way be described as sterile, or even particularly clean and requires renewing at least each season. On the medical side, I have taken Leukotape and other tapes with me in my First Aid Kit and these tapes have very frequently been bought into use. 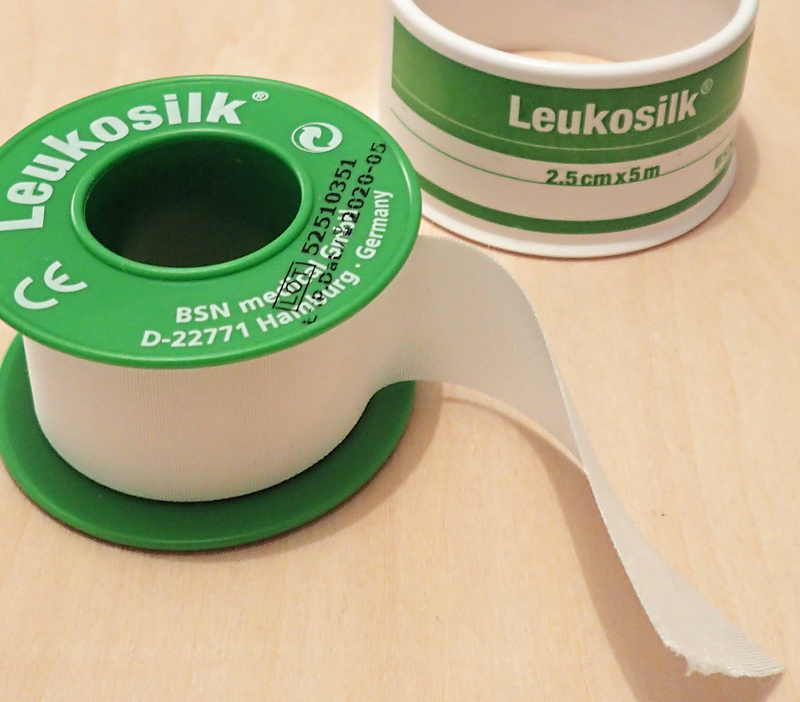 Leukotape can be peeled from a roll and cut into strips, then stuck to silicone release paper. The strong zinc oxide adhesive on the tape is retained after peeling from the paper and it adheres well to the feet, or wherever else required. Some other tapes can be torn by hand with ease. 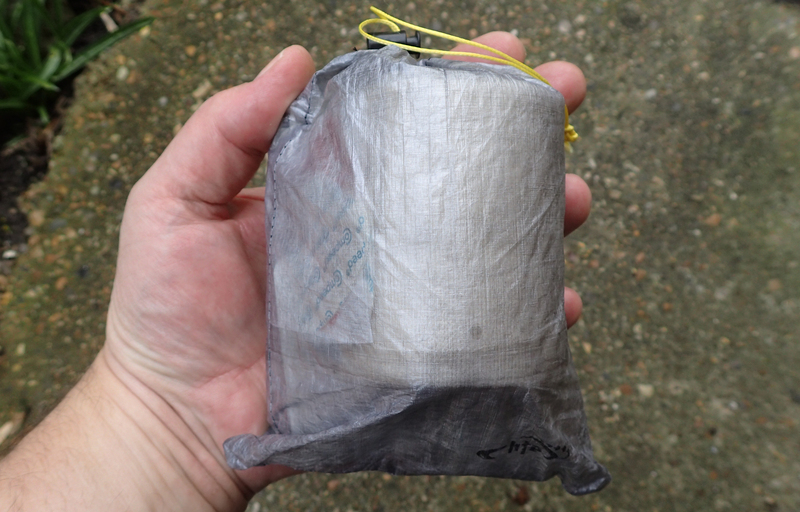 Even a minimalist lightweight hiker could consider including a one metre length of latex-free Transpore tape, weighing only 3 grams, wound onto a short piece of plastic straw, in their kit. This tape has a bi-directional tear which allows it to be easily torn into required lengths or very short strips so no need for scissors or knife. This tape is also stronger and easier to use than micropore tape. 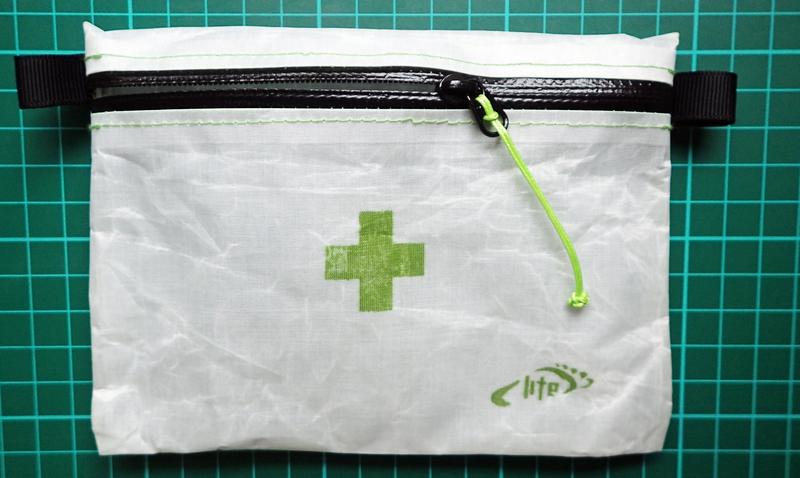 It can be used to hold dressings in place or alone as a covering for minor cuts and grazes instead of a plaster. At a pinch, you could fashion skin closures with this. The tape is hypo-allergenic and porous for breathability. It adheres well to skin and is water resistant so doesn’t come off too easily if applied to feet that subsequently get wet. If you are still including micropore tape in your kit, it is probably time to seriously consider binning it. It simply isn’t up to the job in an outdoors environment and doesn’t stick sufficiently well. 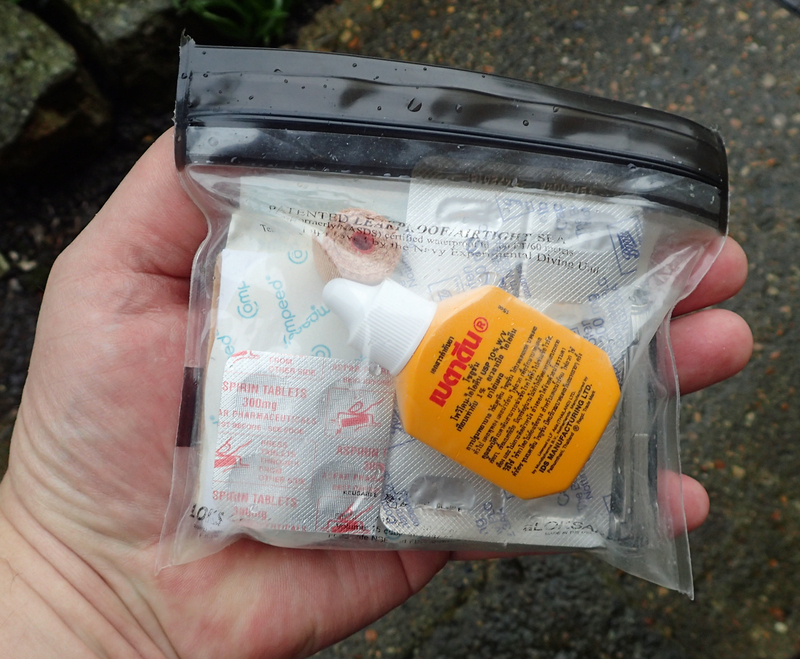 For longer treks I include a fairly new kid on the block in my First Aid Kit. Leukosilk is a low profile tape especially suited to those with more sensitive skin and conforms well to body contours. The polyacrylate adhesive is tolerated well by skin and the fine acetate backing fabric is porous, allowing skin to breathe. Both Transpore and Leukosilk tapes are suited to holding fairly bulky bandages and dressings in place. Transpore The Leukosilk is especially suited to use as a covering to hot spots or blisters on the feet. The three, single use, individually sealed, wound cleansing wipes weigh 2.2g each and are pretty tiny, measuring some 10cm x 10cm each. Or, in English- ‘Chance favours only the prepared mind‘. I am sure that it goes without saying that any contents of a First Aid Kit are next to useless if you do not know what is appropriate to use, how to use it and how to supplement it. A bandanna can be used to make a sling, a trekking pole can be used as a splint, but only if you know that you can and how to do it (and when to do it). There are numerous little wheezes- duct tape to pull splinters out, sit mat as a sleeve splint, water bladder as an irrigation device, it goes on. Take the time to find out how you can best use what you have with you. 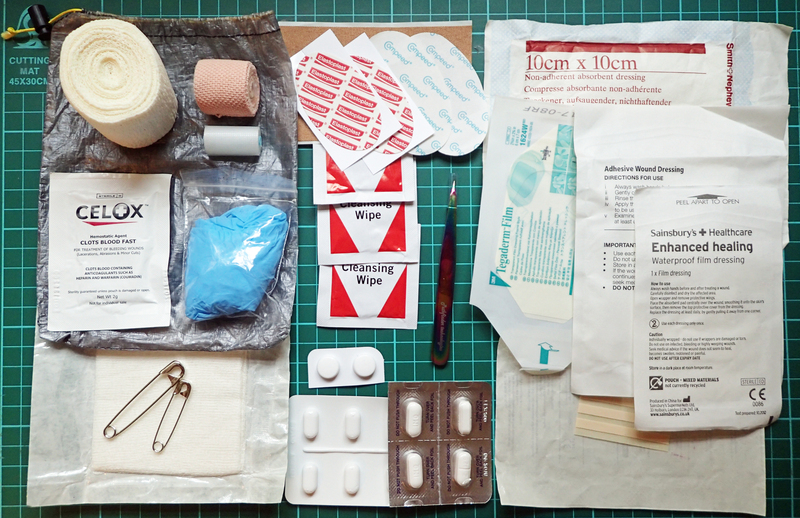 The above used to be our advised order of applying first aid whilst in the British army. Primarily a guide, and nothing more than that, to the order of attention when attending to a casualty. It does focus on the fact that it is not much use treating someone for second degree burns when they are suffocating! A little knowledge can be useful, a bit more knowledge can be life-saving. Consider taking a general or Wilderness First Aid training course. I have done many over the years and have had to put into practice skills I never thought I would have to- these have included CPR, burns (including that caused by radio-frequency), breaks and seizure. However, I am by no means any form of expert and know that my skill level could be much higher. Consider honestly where your own level lies. What lives ‘up-stairs’ in the brain is always going to be more practical than a few grams of contents. That and the understanding that knowing you have a Fist Aid Kit should never mean that you feel you can take risks with yours or anyone else’s safety and health. Painkillers invite considerable comment. Some people pop them with impunity, others with extreme reluctance. I tend to fall into the latter group. Only a couple of years ago I made one of my infrequent visits to see my doctor. Suffering from a painful bruised coccyx, I was living with the pain. The doctor wasted no time in telling me what a fool I was, he was right in that instance. It is important to remember that pain is a warning. By masking pain it may be possible to walk further into injury. However, with judicious usage and understanding that injury is sustained, then painkillers can be the way to go. I am not sure that it has always been that way though. 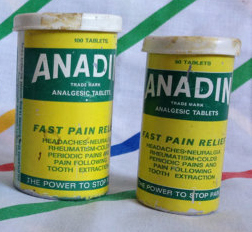 When I was a nipper I would frequently be sent down to the local co-op to buy a small yellow tub containing fifty Anadin for the bathroom medicine cabinet, heaven knows who was chucking them down their neck in the family household! I should be thankful, it seemed that every other week there would be a piece in one of the local papers about someone in the neighbourhood making a suicide attempt by swigging back the contents of a couple of these tubs. With glee, the rag would recount how many tablets had been ingested, almost a ‘how-to’ for other lonely or rejected souls crying for attention. The harm done must have been immense and it is hardly surprising that steps were taken to reduce the number legally available at any one time to a purchaser. The really determined could still get round it but it took effort rather than a casual purchase. Likewise, Aspirin and Paracetamol have long been available over the counter. But that painkiller most appreciated by the present day hiker- Ibuprofen, did not have the regulations surrounding sale relaxed until 1996. Such is the casual regard that this drug is held in by US hikers that it is more commonly referred to as Vitamin I. Gentler on the stomach than Aspirin, which can irritate the stomach lining, Ibuprofen is a cheap and effective way of reducing pain, fever and inflammation but does not thin the blood as much as Aspirin. For half the population, Ibuprofen is also effective against period pain. Beside that, being just one amongst many, I also appreciate what it can do, to an extent, for sufferers of osteoarthritis and rheumatoid arthritis. A word of warning for those who take Ibuprofen at the end of a days strenuous hiking, some research has shown that it will not inhibit muscle soreness. Aspirin is suitable for many, but not all. It is a popular and effective pain killer for general aches, headaches, toothache, flu and will reduce a fever, though it is without anti-inflammatory properties. For those at risk, or perhaps of a certain age, it may be advisable to pack a small quantity of Aspirin in case of heart attack. Taking up to 325mg may be a potential life saver. If taken promptly, the drug reduces blood clotting and will help maintain blood flow through a narrowed artery. For Aspirin to work it needs to work its way through the blood stream to the heart, the fastest way is to chew a tablet and swallow it with water. If an Aspirin were swallowed whole, absorption can be delayed by minutes to hours. A visit to hospital is then called for. It is important to understand that non-steroidal anti-inflammatories (NSAIDs), such as Ibuprofen, can block this effectiveness. I would gently warn anyone who is considering ingesting Paracetamol to the same degree as Aspirin. Paracetamol taken in larger quantities can cause great harm and the liver can be damaged if not careful as to the amount taken. You have heard it before but you really, really, should read the guidelines that come with any of these drugs. They are not M&Ms to be taken with impunity. I very rarely carry more than 16 Ibuprofen (also found in Nurofen or Advil), which is the maximum that it is possible to buy in one go in a supermarket (32 in pharmacies) in the UK. While I could easily make multiple purchases, this is about the maximum I want to be a taking in doses over a number of consecutive days. In any case, Ibuprofen should not be taken for longer than ten days. One or two of the forms of anti-histamine make a good inclusion in a First Aid Kit, particularly for unplanned allergic reaction. While anti-histamines are very safe, it is still sensible to only include these if it has first been established that they are of a composition that does not cause unwelcome side-effects- one uncommon side-effect can be to actually cause itching! Although also available in a cream, lotion or nasal spray, the tablet or capsule form is often more suited for the trail. Anti-histamines can provide relief (not cure) from symptoms of hay fever, allergic rhinitis, allergic skin conditions (including eczema), allergic conjunctivitis, reaction to bites and stings, and occasionally, relief from mild reaction caused by food allergy. Anti-histamines are classified in three groups. First generation anti-histamines are useful for severe allergic reaction but can cause drowsiness and include diphenhydramine and chlorphenamine. Second or third generation anti-histamines are less likely to cause drowsiness. 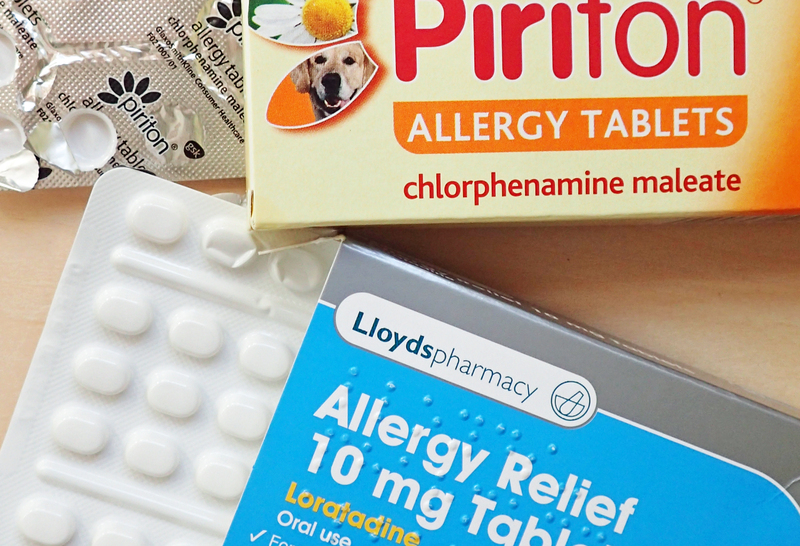 These include loratadine and cetirizine. These are usually recommended and are often useful for treating the symptoms of seasonal allergic reaction. Some anti-histamines are available over the counter while others may be on prescription only. First generation anti-histamines can also be useful as a sleep aid to prevent itching and scratching disturbing a nights kip. Anything that helps to break the itch-scratch cycle is beneficial as scratching can introduce severe skin abrasion/scratches with the chance of infection. Particularly important on the trail where finger nails could be harbouring numerous germs. The above could be carried in a simple ziplock bag, which would actually be heavier than the cuben bag I use but more importantly, I prefer something more robust which is why the cuben bag is employed. No scissors are taken, I use those on the knife carried elsewhere on the person. The small sealed, sterile at present, scalpel blade can be used for trimming tape, gauze or skin as necessary. A third of the weight of the kit is the ACE bandage. This is also wrapped in a small piece of cling film to keep it it clean. The film could, if unfortunately necessary, be used to cover a burn to protect it from infection. The moleskin is kept as a larger piece so that it can be cut and shaped to the required need. There is quite a bit of foot care included in this kit, by the time it is all used up, there should be little need to replace much of it. Various dressings are included in the kit. the transparent, stretchy and flexible Tegaderm is particularly suited to awkward spots- knees, elbows, jaw etc., where there is constant movement. 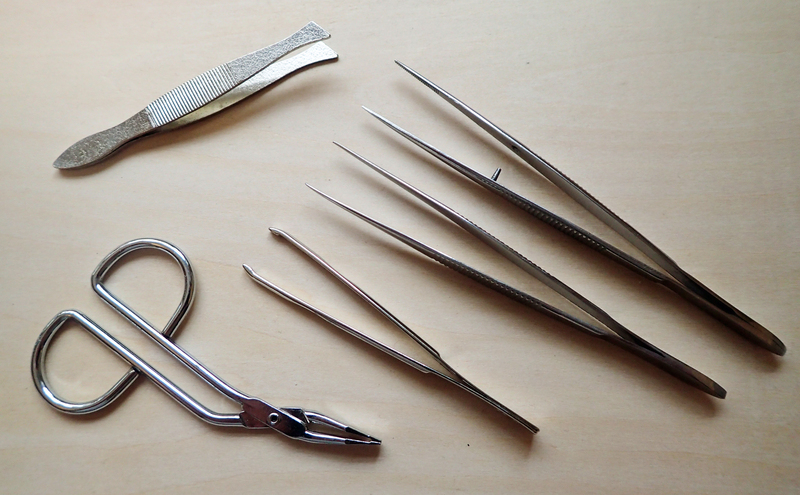 Larger safety pins are taken in this multi day kit so that they can be used to pin items up for drying if necessary. The ‘nappy pins’ have a plastic sliding cap that prevents them opening easily of their own accord. Ibuprofen is a familiar hikers staple. It has analgesic and antipyretic properties and can therefore be useful for relieving muscular and rheumatic pain, backache, migraine, neuralgia, dental pain, fever (high temperature) and for the symptoms of colds and flu. Two forms of anti-histamine are included, one causes drowsiness, the other does not. You may have noticed the little glass 5/8 dram bottles included in my kit. 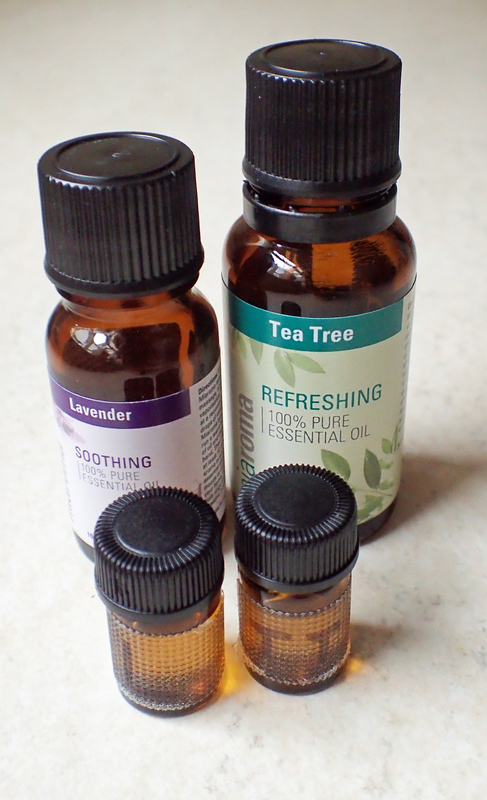 There may be some of you that also ascribe to the powers of essential oils. These are not something I have much experience of at all other than Tea Tree (melaleuca). There is no reason that a small bottle or two (or more) of your tried and tested favourite should not form part of your emergency kit. Lady on a Rock has done an introductory post on the subject and there is a lot more to be found on-line. Lavender alone has an impressive list of properties useful on the trail- Analgesic (pain relief), antiseptic, anti-inflammatory, antibacterial, decongestant and sedative amongst others. Enough there to keep you going! 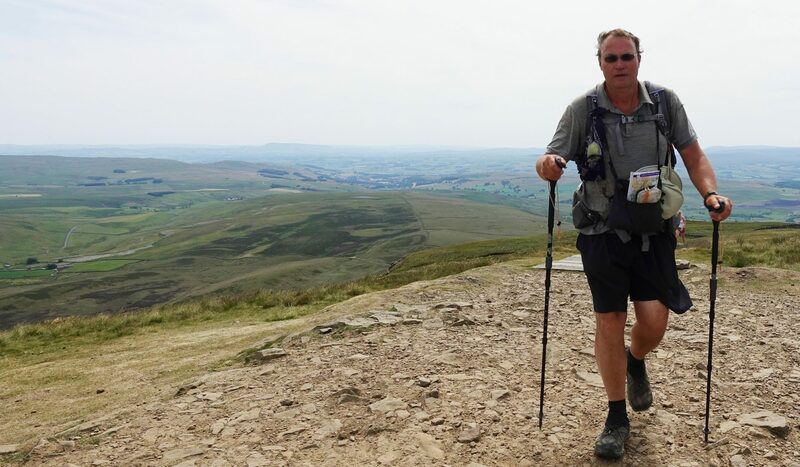 It is the last kit described, or something very similar, that will accompany me on my Three Points of the Compass walk. Do be warned please. I am not a medical practitioner and as I mentioned earlier, First Aid Kits are a very personal item. All that above is what works for me, at present. Some like to include their contact lens solutions, personal anti-histamines, insulin, Tiger Balm, foot creams and powders. Whatever you take, ensure that you both have enough and, important for the lightweight hiker, wherever possible, that you don’t have too much. Consider smaller quantities where you know you can resupply easily. After all, just about any town will be selling Compeeds somewhere. For the lightweight hiker, think about the alternatives you either carry or have around you. In the past I have successfully used pieces of lambs wool, retrieved from barbed wire, as a cushion against a pressure point in ill-fitting boots. Other hacks can be just as simple. Whatever form of First Aid Kit you do settle on, be it minimalist or complex, remember to check it frequently, replacing items that have been used. Many items have a ‘life’ beyond which they lose effectiveness, adhesive loses its adhesion, medicines lose their potency, even duct tape gets frayed and delaminates with time. Some items can be affected by cold or heat too. Prior to each season, check expiry dates and ensure that what you are a carrying is still functional. With many items that form part of a general gear list, it is often wise to review its inclusion if you never use it on a trip, but this is not necessarily the case with the contents of a First Aid Kit. Then, just take care out there.